Confession time: I hate beets. You see, because I'm big on veggies, people assume that I love all of them. And that's just not true. I do like most of them, but some, especially the sweeter root veggies and squashes, take a lot of convincing for me. I'm not big on earthy sweetness, I guess. Beets have never been near the top of my list. Honestly, they don't even make the list. I always tell my kids not to say that they hate a vegetable. I tell them that they may not like it in the way it was served, but they just have to find the way that they WILL like it. And I use my arsenal of cooking techniques to convince them that it's true. So far, it's worked pretty well for me. None of them are big fans of steamed zucchini, but they love it shredded up and crisped in olive oil with a little salt and pepper, and they adore it in muffins. So now, if you ask them, they will tell you that they like zucchini. And if you give them something and tell them that it is zucchini, they will not have an adverse reaction to it. As any parent of young children knows, that's the biggest part of the battle. This strategy has worked well for me with my kiddos. But now it's come down for me to swallow my pride (pardon the pun) and follow my own advice. I don't hate beets, I've just never had them the right way for me. To most people, this wouldn't be a huge deal. Just don't buy beets, right? Except in the spring/summer/fall, we get the majority of our veg from our CSA (which I'll explain about in another post someday), and what the farm grows and harvests is what we get. And some weeks, that seems to be a lot of beets. Beets do have some appeal to me. I drool over beautiful beet greens, with the dark green leaves centered in deep purplish-red veins and the slightly sweet fresh green flavor. I'll chop them up and throw them in risotto, or on top of my morning grits, or in a salad, or even in my creamy beefy veggie stuff. 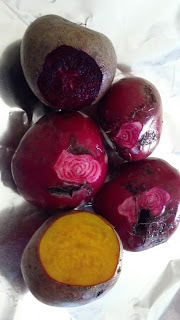 I also love the different colors of beets that you can find, especially the candy-like striped beets. But as we all know, pretty only gets you so far. Parenting is awful some times, especially when you have to lead by example and do something you really don't want to. Like learn to find a way that you enjoy eating a vegetable that you have spent your life hating. Especially when that life is much, much longer than 6 or 8 years. So beets became my new mission. I hate wasting the beautiful fresh organic veggies that we get. I know all the blood, sweat, and tears that Farmer Steve and his crew have put into growing them for us. I had to use those beets. I started with a couple of almost sure-fire methods: brownies and muffins. 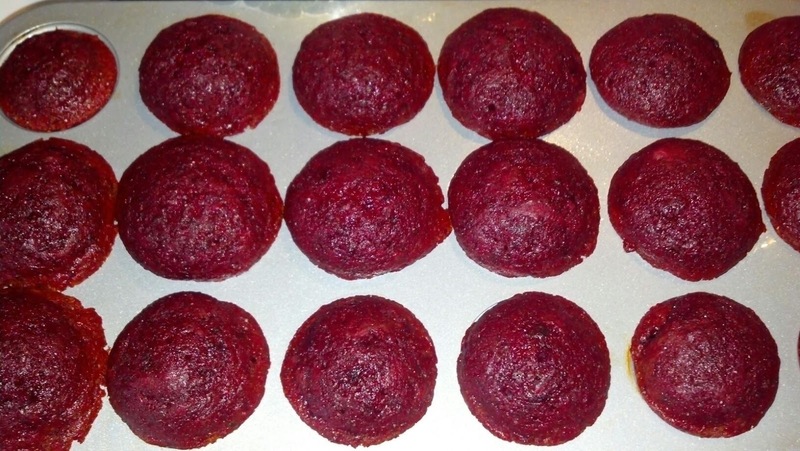 Believe it or not, if you Google "beet brownies" or "beet muffins", you will find a ton of recipes. The ones I've linked are the ones that worked out best for my family. The muffins have become an afterschool snack favorite. Sometimes I add almond extract and poppy seeds into them, sometimes a little pumpkin pie spice. They disappear off the plate, sometimes even straight out of the mini muffin tin before I can get plates out. 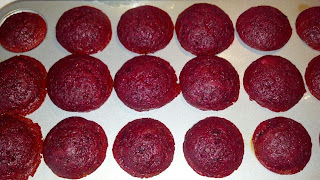 Beet muffins are pretty too! But I don't want to have to resort to sugaring up my beets to like them. And as much as I justify eating more of those brownies than I really should have by saying that they're good for me because they have beets in them, that's probably not so true. So I needed another way to try beets. The Weelicious website has been a great source of recipes and inspiration for me, and I remembered seeing a post on there about beet hummus a while back, but I was feeling too lazy to look it up, and I just wanted to whip something up quickly, as the girls would be home from school soon. It is awesomely pink. A fantastic color, really. Not a color that you usually find to be something edible. I was still pretty suspicious. But it smelled great, so I grabbed a pita chip (more Superbowl leftovers) and dug in. Turns out, I like beets. They're still not at the top of my list, and it's going to take a while before I can handle straight-out roasted beets, but this hummus has proven to me that beets are not on the list of foods I hate. Bonus: the girls loved the hummus too. Not Mr. Picky, but he took a couple of tastes of it with an open mind, which again is big progress for a 4-year-old. This hummus is smooth and colorful and garlicky and delicious. We dipped pita chips and veggies in it until we were stuffed. I will openly admit to sneaking into my fridge and grabbing a spoonful of the leftovers and eating it straight. My next thought is to mix some of it into broth for a thicker soup, and I know the girls will love showing it off at school when I incorporate it into their lunches. 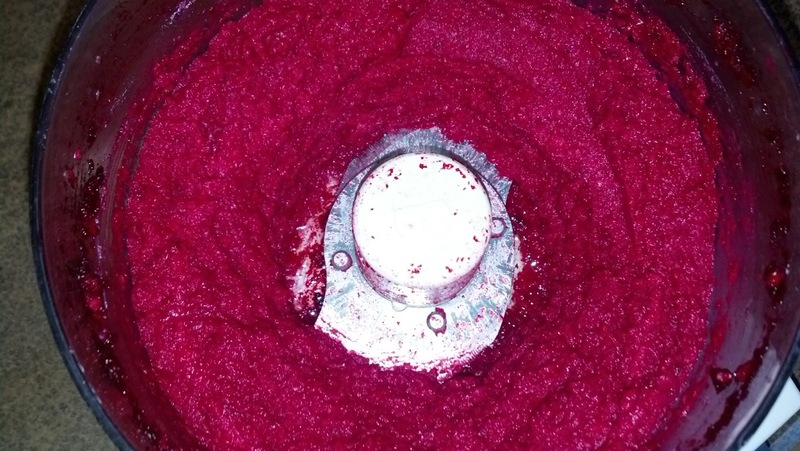 Put all the ingredients except for the oil into a food processor or blender. Start the machine and stream in the olive oil until the mixture is smooth. Taste for seasoning and adjust as needed. Serve with pita chips, pretzels, veggies, or on sandwiches. Perfect for a Valentine's Day snack! This sounds interesting. I actually like beets but don't like most vegetables at all.